Studio Technologies have a range of monitor controllers but only one that supports more than 5.1. The StudioComm for Surround Model 780 Central Controllers and Model 790 Control Console are designed for 7.1 surround monitoring applications, supporting two 7.1 surround inputs and one 7.1 surround output. Features include downmix capability and integrated bass management. One Model 780 can support a combination of up to four Model 790 or Model 71 Control Consoles. 780-01 - 7.1 surround and stereo balanced digital audio inputs; 7.1 surround balanced digital outputs. 780-02 - 7.1 surround and stereo balanced digital audio inputs; 7.1 surround analog output. 780-03 - 7.1 surround and stereo balanced digital audio inputs; 7.1 surround balanced digital and 7.1 surround analog outputs. There is also a configurable input-source time delay, LFE low-pass filter, multiple pre- and post-fader surround outputs, configurable downmix and mute/solo functions, and bass management, along with a multi-format sync input. Blue Sky’s Audio Management Controller (AMC) builds on their previous-generation Bass Management Controller and adds many new capabilities. The AMC provides control over levels, balance, mute, selection of house curves, and various other system configuration settings. The AMC is fitted with a big weighted “old-school” rotary control for primary adjustments as well as additional hardware controls via lighted buttons, and a display screen. The AMC is an 8-channel DSP-based system and supports configurations up to 7.1. Any input can be routed to any output and multiple inputs can be mixed and routed to any outputs. Each channel features 1/3 octave EQ, 8 bands of parametric EQ and filters, and variable delay for time alignment. Other features include 8 system presets (EQ curves, etc. ), lip sync delay, 7.1 bass management with variable cutoff frequency per channel, and an externally-accessible mute input. The Bass Channel has a 10 band parametric equalizer. The Digital inputs have a built-in sample rate converter, which can be bypassed in the Pure-Digital mode for 48 kHz/96 kHz operation. The Digital I/O is AES/EBU 110 ohm balanced transformer coupled. Analog I/O is balanced, and nominal input levels are selectable between +4dBu and -6dBu. Colin has designed the A-Mon as a analog Stereo / 5.1 / 7.1 monitor controller for use with his TMC-1 remote. Using feedback from existing TMC-1 customers, the A-Mon is a full studio monitor system that incorporates some unique features including re-assigning the rear surround to side surround when switching from 7.1 to 5.1 with surround level correction. The TMC-1 is available for four different systems, the Avid XMon, DAD AX32/Penta 720, the Trinnov D-Mon and CB A-Mon. Note the specs vary slightly depending on which unit you are connecting the TMC-1 to. TC Electronic has a system that brings together monitor control, monitor calibration, loudness metering and so much more. Clarity X covers channel formats up to 7.1 surround and includes monitor calibration, centre channel balance, downmix and loudness compatibility. Clarity X comes with AES inputs and outputs, but it can be expanded with MADI I/O as well. For instance, it is possible to connect a 5.1 or 7.1 surround set of monitors as well as two or more different stereo sets – or two complete 5.1 or 7.1 sets even without expanding with MADI. For surround setups, Clarity X offers full bass management control as well as solo/mute functionality for each speaker in the system. Clarity X comes with a sleek small-footprint remote control that offers hands-on control of the most important monitor control functions as well as a row of user-definable function keys that can be programmed to suit any workflow. Besides using the dedicated remote control, you operate Clarity X through their free Icon control software that gives you access to all the setup tools, parameter settings, preset management, etc. The Icon application runs on PC and Mac and if you're already using other Icon-compatible TC products, you can easily add Clarity X to your existing setup. Clarity X comes with 16 AES input channels plus AUX (analog), TOS and ADAT. On the output side, you get 16 AES channels plus 8 analog outputs as well as headphones out. In total, you get 26 channels of inputs and outputs. Add the option of expanding with 64 MADI input channels and your input channel count increases to no less than 90. The routing is extremely flexible, for instance you could switch seamlessly between two full surround mixes - maybe even one 5.1 and one 7.1 mix plus a stereo reference signal. You could then monitor your source(s) on a 5.1 or 7.1 monitor setup, but also switch to one or more stereo pairs to check how well your mix translates to other channel formats and speaker sizes. Independently, you can route any input channel to the dedicated meter engine. The Trinnov MC Processor has been designed to gather together speaker processor capabilities, monitor management, editable downmix matrix, dynamic range control, acoustic analysis, loudspeaker/room optimization and EBU R128 compliant metering in a single device. Trinnov MC Processors are based on a flexible hardware platform scalable from 4 to 64 channels. Both AES8 and Analog8 standard configurations allow for 8 simultaneous I/O and 8 processing channels. Optional AES8 and/or ADA4 boards may be added to provide up to 16 simultaneous I/O channels. Alternatively, AES inputs can be configured for input source switching of 3 groups of 8 inputs (3xAES8). Above 16 channels, the Trinnov Audio Core section can be replaced by an RME HDSP MADI interface that handles up to 64 digital I/Os. The Optimizer software option turns the MC Processor into an advanced Loudspeaker/Room correction system, taking the room acoustics into account to tune and align speakers in both frequency and time domains. The Optimizer is designed to ensure a better mix translation between rooms and dramatically accelerates the engineer’s workflow and decision making during recording and mixing. The SmartMeter software option provides reliable quality control, with a comprehensive metering toolkit that includes EBU-R128 compliant Loudness and True Peak metering, PPM, QPPM, vectorscope, correlation meters and surround analyzer. The SmartMeter helps you to improve the consistency of loudness throughout your productions. Customisable Profiles: 8 customisable profiles allow to mix up different parameters independently from any of the 29 existing user presets. Remote Control: real-time remote capabilities can be achieved using RS-232, Ethernet IP protocol, optional GPIO boards, optional IR module and/or KVM, optional VGA/DVI touchscreens, and from any PC, Mac, iPad, SmartPhone (with VNC client applications, through the network). Backup: the processor also supports FTP reporting and USB parameters storage/backups. Login: lock sensitive settings with a username and password. At NAMM 2018 SPL announced a new 16-channel analog multi-format monitor controller, the MC16 which they claim is a first of its kind with a planned release in Spring 2018. The new SPL MC16 monitoring controller operates on SPL’s 120V DC audio rail and has what SPL claim is the world’s first 16-gang custom-designed precision potentiometer. As well as the 16 channel monitor level control there is a Solo button, which when enabled, allows you to select any combination of speakers to listen to. There is also a 20dB Dim button and a Mute button, which is automatically enabled when the unit is powered up. When you disable the Mute button the last speaker combination is recalled. The MC16 offers balanced inputs for two sets of 16 channel inputs, one set on XLRs and the second set on a DB25 connector, so you can monitor a second source, like a playback system, to provide a reference feed. On the right-hand side are 3 preset buttons so that you can save your 3 most used speaker configurations. In total, you can save 6 presets, 3 Solo presets and 3 speaker array presets. A sheet of button labels is provided so that you can customise the buttons to suit your own monitoring configuration. If the provided labels don't cover your requirements then you will be able to download a template from the SPL website and create your own labels. Grace Designs has been working on a new monitor controller which will support up to 22.2. The m908 is all new, from the ground up system architecture with powerful DSP functionality, their latest generation AD/DA converters, and intuitive control platform, the m908 is being designed to provide an all in one monitoring solution for an array of formats and workflows and is expected to be released in the 2nd quarter of 2018. Up to 3 stereo CUE outputs in addition to stereo headphone monitoring when not using more than 7.1 speaker system. Thanks to community member 'mickel' for telling us about the Grace Designs m908. The JBL Intonato 24 Monitor Management Tuning System has been designed to provide an easy setup, automated calibration and comprehensive control of professional monitoring systems. Housed in a 2U rack-mount enclosure, Intonato 24 calibrates and controls up to 24 speakers configured as stereo, surround or immersive audio systems. 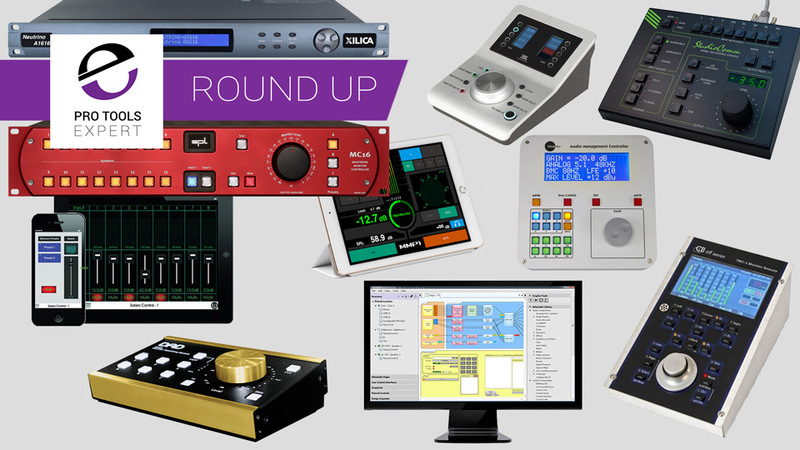 You can create and instantly recall customized routing of up to 24 analog, digital and networked audio sources. Included software and an optional Desktop Controller are designed to put the system’s monitoring features at your fingertips. Intonato, from the Latin verb Intonare meaning “tuned,” “matched,” “in tune,” describes a primary attribute of all speakers in the ideal control room monitoring environment. Compatible with all professional studio monitors. Input connections for 24 analog, AES/EBU inputs; up to 256 channels of networked audio in HARMAN BLU link or Dante format (with optional BLUDAN interface). Software-controlled analogue input sensitivity switches, level indicators and gain trims. Output connections include 24 analogue outputs to powered speakers and power amplifiers; BLU link output allows networked connection to HARMAN Crown power amplifiers. Selectively monitor via one or more monitoring systems of up to 24 speakers. Volume, mute and dim controls, plus individual speaker mute and solo. Automated speaker calibration with included microphone precisely balances, tunes and aligns all speakers to deliver greater accuracy to the mix position in any room; 12 bands of room EQ, delay, and level per speaker. Per-speaker, 8-band user EQ allows standard and customised response curves such as X-Curve and compensation for perforated screen transmission loss. Sophisticated subwoofer integration for LFE channels and bass management. Variable audio/video sync delay allows compensation for video display latency. Stereo aux out with dedicated level control, EQ and talkback system allows an independent feed to be sent to talent or a remote green room. Create, store and instantly recall project-specific configurations and speaker tunings. Intuitive setup and control with included Macintosh, Windows and iOS/Android tablet software or optional Intonato Desktop Controller. Low-noise fan for quiet operation. The JBL Intonato Desktop Controller features a large volume knob and eight switches. The knob and switches are laid out to make the workflow as intuitive as possible. Each control has a single purpose and an easy-to-read label. There's no need to scroll through menus to find key functions—they're all literally at your fingertips. Easily adjust volume, Speaker-Mute, Speaker Solo, Talkback, Bass Management On/Off, Scene recall and more. 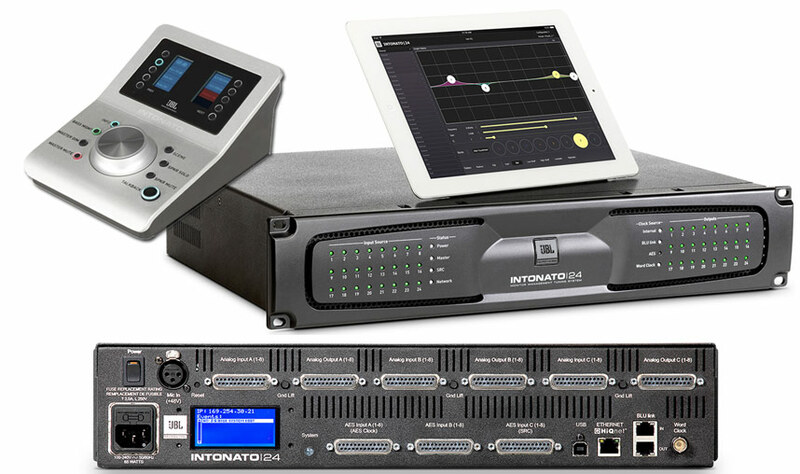 The Intonato Desktop Controller's twin multicoloured LCD displays provide loudness information as well as show the status of other key system functions. The Yamaha MMP-1 is a multichannel monitor controller with room EQ, delay and level and has Dante support too. The "DSP channel inputs" are a separate feature besides the matrix in the MMP-1. For monitor EQ, level and delay you can route any analog, AES or Dante input or output via the 32x32 matrix. Comprehensive Monitor Control - Up to 32 channels of monitor processing supports formats from stereo to immersive audio, plus comprehensive management of studio communication and audio devices. Flexible Bass Management - Bass management using standard or FIR crossover filters can be flexibly configured within a 32 x 32 channel speaker matrix. Speaker Management - Time alignment delay, EQ, and other final-stage audio output adjustment tools are provided on all channels. Channel Processing - Eight channel strips feature four types of EQ, VCM vintage compressors, and more, for extensive processing capability in a remarkably compact space. Post-production Recording Support - In addition to an ample selection of talkback, cue, and GPI functions, commentary functions provide extended voice-over recording support. DAD have released both software and hardware options which can turn a DAD AX32 and the Avid MTRX into a powerful monitor controller system. At AES 2017 DAD showed their new additions to their AX32 and DX32 units, the MOM monitor control remote control and the accompanying SPQ speaker processing card was announced at NAMM 2018. With the associated software, these two units bring comprehensive speaker correction and control. Pro Mon 3 is an audio monitor control solution that offers stand-alone monitor control functionality and speaker processing, covering a wide range of functionality for music recording studios, location music recording, as well as post-production environments of any size and type. The Pro Mon 3 license unlocks a wide range of additional monitoring control features that have been added to the DADman software, enabling AX32/DX32 to operate as a powerful processor with full control of signal routing, control room speaker levels and monitor cues in any channel format including stereo, 5.1, 7.1.4, Dolby Atmos and other 3D and immersive audio formats. The control and configuration are managed by the new DADman 5.1 software, which also serves as a control centre enabling devices compliant with Avid Eucon or MIDI to operate the monitor functions. The new SPQ Speaker Processor card for the AX32, offers 128 channels with 1024 filters that can be allocated to the outputs of Pro Mon 3, all with a 56-bit floating point calculation precision, giving at filter dynamic range of in excess of 130dB. 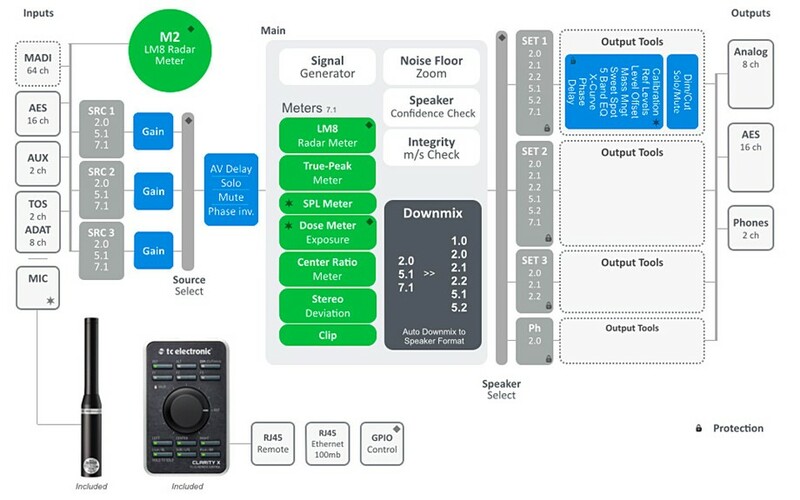 Multiple monitors and cue outputs in various channel formats can be configured and controlled from one or more hardware MOM’s (Monitor Operating Module) with individual cue mix functionality and dedicated monitor mixing, adjustable parameters include level, pan, cut, mute and even downmix from, for example, for a 7.1 multichannel format. All setting and configuration can be saved and recalled, allowing monitor configurations to be changed quickly and easily. The Soundweb London BLU-806DA offers configurable I/O, configurable signal processing, Dante / AES67 audio and a high bandwidth, fault tolerant digital audio bus. It has open architecture which is fully configurable through HiQnet Audio Architect software. A palette of processing and logic objects and a “drag and drop” method of configuration and designed to provide a simple and familiar design environment. This processor features Dante / AES67 audio with primary and secondary ports for fault tolerance, with control through a separate Ethernet port. The BLU-806DA also features a low latency, fault tolerant digital audio bus of 256 channels which uses standard Category 5e cabling giving a distance of 100m between compatible devices. HiQnet Audio Architect is a software application designed to configure and control the widest varieties of professional installed sound systems. This system design and configuration software present a system design philosophy centred on operational workflow, and the use of a diagrammatic representation of the physical venue. Devices understand both their physical and logical placement - in racks and rooms - and the software becomes ‘educated’ about how they are to be used in the real-world. The drag-and-drop networking interface provides a convenient user experience whilst providing system-wide networked audio routing and advanced tools for custom panel creation, creating logic rules, configuring access control and many more. The Xilica Neutrino comprises a DHCP-enabled processor series available in four primary I/O model sizes – 8×8, 8×16, 16×8 and 16×16 with Mic/Line and 48V phantom power selection per input and premium grade mic pre-amps. Neutrino is founded upon the dual-notion of drag-and-drop simplicity, and the ability to configure the precise DSP system required by the customer. Accordingly, Neutrino’s drag-and- drop SolaroConsole software can be used to accommodate each project need, and incorporates a GUI that is designed to reduce DSP design time. Neutrino products can be controlled in a number of ways: via Ethernet using the included SolaroConsole software GUI; with the logic input/relay output ports; the optional NeuPanel Series Mini and Touch 7 wall controls; iOS and Android devices via the free SolaroControl apps; and any third-party controller. The connectivity capability of the Neutrino models is customisable through a number of different variants. The Neutrino-N model versions (Neutrino A0808-N through A1616-N) provide Audinate Dante-enabled network audio capability. This makes it possible to digitally transport 16×16 I/O channels of Dante network audio bi- directionally over Ethernet. Dante and analogue audio streams can be converted back to analogue or to Dante network audio using another Neutrino-N processor or Rio interface. In addition, it is possible to use Neutrino-N and Rio interfaces in conjunction with other Dante-enabled brands and devices – making Neutrino entirely in line with the growing global popularity of Dante technology. Other products in the series include the Neutrino-D model versions (A0808-D & A1616-D) providing digital I/O capability of 8×8 AES/EBU channels on a separate connector, whilst the Neutrino-ND combo model versions (Neutrino A0808-ND and A1616-ND) deliver a combination of Dante-enabled network audio I/O (16×16) and digital I/O (8×8 AES/EBU). You can freely design your own schematics and freely define the iPad/iPhone/Android surface. It sounds excellent and is easy to config. And the best thing is I can use it as a stand-alone pro Tools interface via a Dante virtual sound card which saves me tons of weight when I need to move my kit to an edit room abroad which happens once in a while. I have 16 I/O with Dante on a single CAT6 cable from my Mac Pro. All that in a one unit box. In that sense, it becomes a 16 I/O Pro Tools interface when you have the Dante Virtual Soundcard installed on your DAW computer. Support is very responsive. I'm very happy and it's significantly less expensive than something like QSYS. But it's not as modular. So if you need it to be further expandable or you need more than 16 analog outs for your speakers then I'd look at QSYS. I use my iPad. They do offer physical remotes like wall mount panels to recall presets or set volume but those are more for installations (venues, conference rooms etc. etc.) but they are too limited for the things we need them for. The touch panels are essentially Android tablets in housings. The free iOS app runs on the iPhone and iPad and they are fully customizable from the config software. I made a surface with single speaker mutes, DIM, mute all, mute front, mute surrounds, LipSync Delay setting and bypass, different SPL calibrations and output meters on one page. The control software for the Mac is where you design your DSP signal flow also has a Dante controller built in so you actually don't need the Audinate Dante controller app. You can patch all your Dante devices from the same program. The Intonato or Yamaha are fixed systems that are pretty limited in their I/O and configuration. The Q-sys is a Linux-based system with tons of card slots and expansion chassis. There are infinite ways to create a GUI on iPad or several other touchscreen devices. Total user programmability through their PC app. Q-SYS is a software-based platform built around an open IT-friendly ecosystem. It leverages the power of Intel processing, the robustness and mission-critical reliability of a Linux operating system, and the interoperability of IEEE networking standards. The Q-SYS Core 110f is the latest addition to the Q-SYS Core family, providing a solution for small, single room projects up to the largest Enterprise scale deployments. The continuity of the Q-SYS software-based DSP platform the Q-SYS Core 110f to leverage all the features that are available across the entire Q-SYS™ Platform. Class leading I/O: Core 110f has 24 I/O + USB, POTS and VoIP simultaneously offering the best cost to I/O ratio in a single SKU, single chassis product available on the market. 8 Flex Channels: Nearly all the flexibility of a card-based DSP solution without the hassle of multiple SKU’s and custom ordering. True IT Software Integration: The Q-SYS Software platform is a true IT integrative solution that is free of the fixed hardware limitations seen in competing products. It allows for greater functionality such as Layer 3 routing, LDAP contact server integration, SNMP monitoring, and more. Suite of Software-Based Conferencing Technology applications: Built and owned by QSC from the ground up allowing for continued refinement, without any additional hardware. The suite includes next generation acoustic echo cancellation (AEC), multiple-instance SIP softphones, gain sharing and gating automixers. The Q-SYS Core 510i represents the second generation of QSC’s Integrated Core Platform. It features eight I/O card slots, which can be populated with any combination of Q-SYS I/O cards allowing for up to 128x128 local channels plus a total of 256x256 network channels for diverse connectivity options. The Q-SYS Designer Software has been designed to be a powerful yet simple advanced DSP software application. This software enables the user to create designs for the Q-SYS Integrated System Platform. The system design environment was created specifically to be intuitive and easy to use. It is laid out without clutter or complicated multi-level menus. As a result, the software allows system integrators to focus their energy on building the audio system, rather than labouring over a complex software learning curve. One Software for all System Sizes: Q-SYS Designer Software can be used with ALL Q-SYS Cores and peripherals. Emulation Mode: Build the majority of your system without hardware. Third-party peripheral support: Q-SYS allows for control of external devices through available LUA scripting. User Control Interfaces: Design custom buttons, import graphics, and build user controls for touchscreen controllers. For smaller rooms, the JBL Intonato and the Yamaha MMP-1 are the ticket. Both very nice boxes that will upgrade nearly any room they go in for the vast majority of people here on the DUC. The Q-SYS does all you want to do. I can control it from an iPad, iPhone or more. In my room, we are now doing Dolby Atmos, Auro-3D, DTS X and IMAX 12.0. I have updated to a QSC 500 with Dante and a QSC 8IO also with Dante so now I have 128 outputs. I also put in a DAD AX32 and a DAD DX 32 that route all the Avid MADI units and Dolby Atmos RMU through it. When setting up the Q-SYS I ran into network hell and QSC Q-SYS Tech support was unbelievable! They really blew me away with their willingness to sort out the issues I was having with Dante. It ultimately was not their issue but they solved my problem. Their support which by the way is 24 hours a day couldn't be better. I hope this roundup has been helpful. If you have any comments or experiences of any of these systems then please do get n contact with us, or leave the comments below. If we have missed any systems that can support 7.1 or higher do let us know, so we can update this article accordingly.